F I P NO 24 (1928) The 6 ton scow F I P No 24 stranded and was lost at Kingsmill Shore August 7, 1928. There was no one aboard at the time of the casualty. FAIRLAND (1931) The 14 ton wooden oil screw Fairland was destroyed by fire at 5:00 p.m. Wednesday July 15, 1931 in Idaho Inlet. Owner and master R P Cipic left for a seining trip with a crew of six July 12, 1931 out of Port Althorp. They fought the fire for an hour alone and then were assisted by the Arab and the Rio Grande but the fire had made too much headway to stop. The Fairland was beached in Idaho Inlet where she was totally consumed by flames. All that was left of the vessel was a small portion of the stern. In the casualty report filed by Cipic at Ketchikan July 22, he places the value of the Fairland at $10,000 no cargo. Insurance on the vessel was said to be $7,000. Weather at the time of the loss was slight NE wind and daylight. FAIRWEATHER (1965) The 70 foot wooden oil screw fishing vessel Fairweather stranded and was lost October 5, 1965 at the head of American Bay. Comment: I have charted this loss in the American Bay on Dall Island. There is also an American Bay on the Alaska Peninsula. FALCON (1940) The 10 ton 38 foot gas screw fishing vessel Falcon was consumed by fire October 11, 1940 one half mile off of Hood Bay. The four persons aboard made it to safety. FALCON (1967) The 7 ton 30 foot wooden gas screw fishing vessel Falcon foundered June 11, 1967 at Meyer’s Chuck Harbor, Ketchikan. FAMOUS (1964) The gas screw Famous foundered October 15, 1964 in Frederick Sound. FARRAGUT (1956) The 13 ton 33 foot wooden gas screw fishing vessel Farragut foundered December 17, 1956 off of Point Higgins. FEARLESS (1922) 90 mile an hour SE winds caused the anchor chain to carry away on a log boom that the wooden gas screw Fearless was tied to in Howkan Narrows at 5:00 a.m. September 24, 1922. The vessel was forced ashore by the logs and lost. The value of the Fearless at the time of the casualty was $1,500 with no cargo or insurance. The crew of two survived. FERN (1940) The 10 ton 34 foot wooden gas screw Fern stranded and was lost in the middle of George Inlet in 1940. There was no one aboard and no lives were lost in the casualty. FIN FIN (1960) The 8 ton 30 foot wooden gas screw fishing vessel Fin Fin foundered February 27, 1960 in Zimovia Strait between Wrangell and Woronkofski Island. FISHER (1977) The 8 ton oil screw Fisher burned August 16, 1977 between Tree Point and Ketchikan. FISHER BOY (1944) The 18 ton 41 foot wooden gas screw fishing vessel Fisher Boy was lost in a collision with the oil screw Admiralty in Washington Bay September 25, 1944. FLAMINGO (1954) The 19 ton 45 foot wooden gas screw fishing vessel Flamingo foundered May 22, 1954 at Outer Point (Outer Rocks), Khaz Bay. FLEETWOOD (1992) The 21 foot salmon troller Fleetwood grounded and sank March 3, 1992 southeast of Shelter Island. Both crewmen donned survival suits and swam to the beach where they were rescued. FLORA (1923) The 22 ton wooden gas screw Flora was lost at 6:10 a.m. January 24, 1923 after stranding at Duck Island. Master and owner, Ole S Bjerke of Seattle stated “heavy snow and strong tide carried vessel off course.” The weather at the time was dead calm sea, light northeast wind, dark and snowing. The gas screw Hideveld took the crew off of the Flora the morning after the stranding and brought them to Ketchikan. The Flora, worth $7,000 with no cargo was a total loss. She was insured for $4,000. At the time of the casualty, the Flora was bound for Ketchikan, having left Prince Rupert January 23, 1923. FLORA (1927) Fire from an unknown source destroyed the 10 ton wooden gas screw Flora at the Standard Oil Dock at Petersburg at 9:00 a.m. October 28, 1927. The Petersburg Fire Department and the gas screw Highway rendered assistance. The 3 person crew survived the casualty, but the Flora, valued at $1,000 was a total loss no insurance. FLORENCE D (1980) The fishing vessel Florence D sank April 16, 1980 at Circle Bay on the southwest coast of Woronkofski Island. FLYING CLOUD (1946) The 20 ton 41 foot wooden gas screw fishing vessel Flying Cloud foundered November 16, 1946 off of Point Gardner on the south end of Admiralty Island. FORMAN F (1956) The 6 ton 28 foot wooden gas screw fishing vessel Forman F foundered August 22, 1956 on the north shore of McHenry Anchorage, Etolin Island. FORRESTER (1975) Frank Phillips, a North Bend, Oregon fisherman was lost when his 32 foot fishing vessel Forrester collided with the Alaska Marine Highway ferry Malaspina June 21, 1975 in Olga Strait. FORT UNION (1930) The 2,654 ton 267 foot wooden barge Fort Union was beached for salvage and broken up at Ship’s Cove, Port Conclusion September 1, 1930. Her hull was said to be rotten and her value only $500 at the time. FORTUNA (1959) The 10 ton 36 foot wooden gas screw fishing vessel Fortuna foundered May 5, 1959 approximately two miles off of the mouth of Burnett Inlet in southeast Alaska. FOX (1915) The 15 ton 52 foot gas fishing boat Fox caught fire and burned at Shelter Island near Juneau September 4, 1914. The three persons aboard made it to safety. FOX (1995) The 31 foot wooden salmon seiner Fox flooded, capsized and sank August 15, 1995 in Smuggler’s Cove. The load of fish onboard shifting contributed to the loss. All five crewmembers made it to safety. FOXIE (1935) The 10 ton 33 foot wooden gas screw fishing vessel Foxie burned August 1, 1935 at Tenakee. The 2 persons aboard made it to safety. FRANCES R (1915) The 38 foot wooden gas boat Frances R was found sunk near the mouth of the Chickamin River October 27, 1915. She had departed Sitka on October 10, 1915 with Charles Alexander “Sandy” Clark, Mike DeCosta and Reginald F Irwin of the U S Bureau of Fisheries on board bound for the Chickamin River to investigate illegal fishing. No sign of the three men was ever found, even with substantial rewards posted by the family of R F Irwin. Kidnapping and murder were considered as possibilities at the time of the disappearance of the men but nothing was ever proven. Evidence found aboard the Frances R indicated that Sandy Clark and inspector Irwin took the vessel’s skiff up the Chickamin River leaving cook Mike DeCosta behind. The skiff was found bottom up in Behm Canal with no sign of the two who had been aboard. The anchor line of the Frances R had been extended and indications were that Mike DeCosta had done so in order to allow the vessel to drift onto the beach so that he might go in search of Clark and Irwin. None of the three men were ever found. FRANCES R (1920) Engine trouble caused the 13 ton gas screw Frances R to strike a rock and strand at Lyman Point Wednesday at 7:00 p.m. March 31, 1920. The two aboard made it to safety, but the Frances R, valued at $4,000 (no cargo) was lost with no insurance. They had departed Ketchikan that day bound for Hadley. Weather at the time was “heavy wind-thick snow-very dark.” Master of the Frances R, Arthur Propp stated in the Report of Casualty filed at Ketchikan “Could not avoid casualty as engine had stopped, and no way to prevent striking.” The vessel drifted to shore and was dashed to bits. FRANCIS W (1998) The 42 foot salmon troller Francis W was destroyed by a galley stove fire October 19, 1998 at Ketchikan. There was no one on board at the time of the disaster. FREDA (1988) The fishing vessel Freda capsized and sank September 11, 1988 in Dixon Entrance. FREDELIA IV (1918) The 21 ton seine boat Fredelia IV was lost one mile south of Pleasant Bay in Seymour Canal at 5:00 a.m. October 31, 1918. The Fredelia IV was towing the barge Neptune in a 60 mile an hour gale when the tow line broke and the Neptune and Fredelia IV collided. The gas boat Baltic picked up all hands. 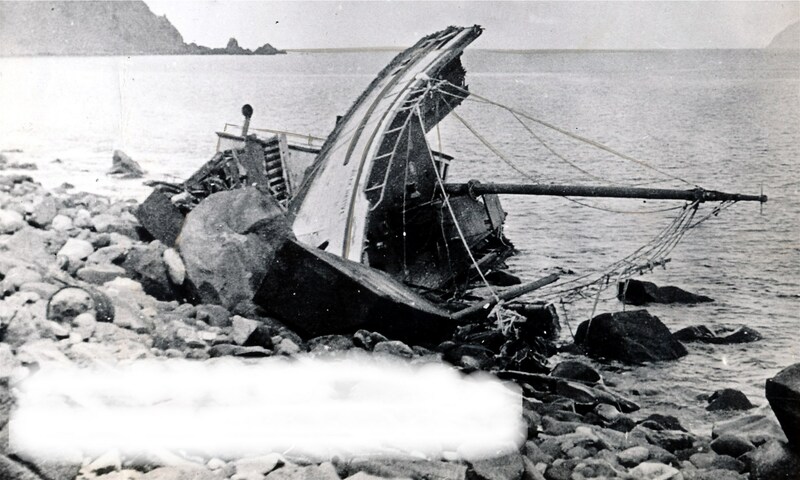 The owner and master, D J Halferty of Seattle and an engineer were the only two aboard the wrecked vessel. The Fredelia IV, valued between $4,500 and $6,000 was a total loss with no insurance. Source: U S Coast Guard Report of Casualty filed by H H Hungerford for Halferty November 12, 1918. Hungerford, a business associate of Halferty was left in Alaska to salvage what was possible. FRISCO (2000) The 50 foot wooden salmon fishing vessel Frisco struck an underwater object, flooded and was lost August 21, 2000 at South Craig Point on Zarembo Island. All four crewmembers abandoned the vessel to the seine skiff and reached Wrangell safely. FROLIC (1949) The 9 ton 36 foot wooden gas screw fishing vessel Frolic foundered August 17, 1949 near Kane Island in Salisbury Sound. FROLIC (1955) The 14 ton 31 foot wooden gas screw fishing vessel Frolic burned August 4, 1955 at Hydaburg Cooperative Dock in Hydaburg. FROSTY (1951) The 6 ton 26 foot wooden gas screw fishing vessel Frosty stranded and was lost in February of 1951 on the beach at Knudson Cove.